In June last year, I wrote about “The Jazz Age: American Style in the 1920s”, an exhibition I saw in New York City. Among the magnificent jewels on display was a pair of Cartier bracelets bought by Gloria Swanson in 1930 and now part of the maker’s collection. Those bracelets made an impression on me, and I noticed the star wearing them in a scene in Sunset Boulevard, which I recently viewed on television. Let me tell you about these jewels, the woman who wore them, and the movie. A myriad of movie stills and publicity photos, including this 1940s portrait, indicate that Gloria Swanson wore these stunning flexible bracelets often. Though made from the same materials – platinum, diamonds, and half-disks of rock crystal – the bracelets are actually slightly different in design. Unfortunately, Cartier would not grant me permission to publish a photo of the pair, but you can see them here on their website. According to Hollywood Jewels, the bracelets “were the inspiration of Jeanne Toussaint,” the creative and artistic director at Cartier for several decades, who had “an intuitive flair for fashion and precious jewelry”. She is credited with introducing materials such as rock crystal as components of the firm’s fine jewelry designs, to make them more affordable during the Depression. The book’s authors comment: “Swanson’s bangles are perhaps the finest example of a Toussaint jewel incorporating rock crystal”. 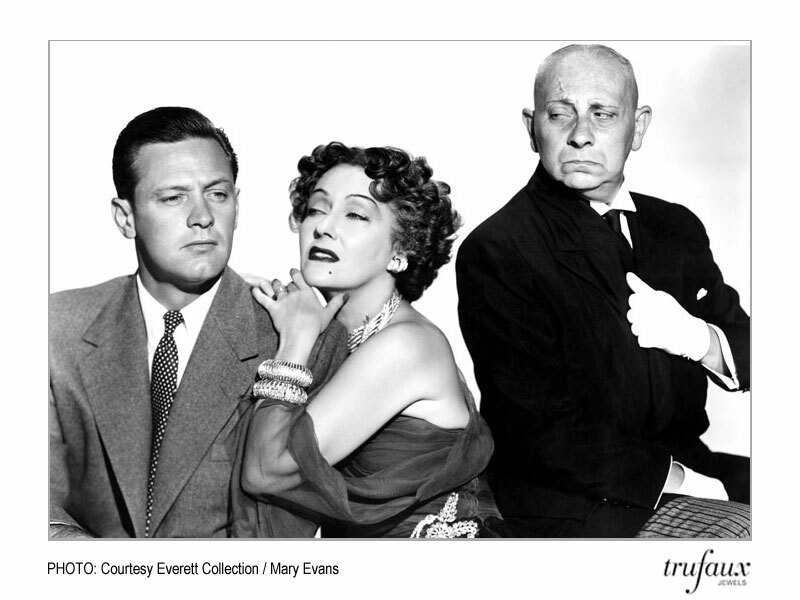 Cartier’s website states that the bracelets are “not only part of the history of jewelry but also part of the history of movies” because Swanson wore them in at least two films: Perfect Understanding (1932) and Sunset Boulevard (1950). Let me tell you about the latter. 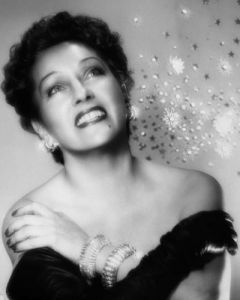 Sunset Boulevard is the story of Norma Desmond (Gloria Swanson), a former silent-movie star who is desperately trying to make a comeback with the assistance of Joe Gillis (William Holden), a down-on-his-luck screenwriter. On the run from creditors trying to repossess his car, Joe takes refuge in the driveway of a decaying mansion on Sunset Boulevard. The door to the house is opened by Max (Erich von Stroheim), the butler. Mistaking Joe for the mortician who is bringing a coffin for Norma’s dead chimpanzee, Max immediately ushers the man upstairs to meet “madame”. When the faded film star learns that he is a screenwriter, she hires him to edit the lengthy script she is writing for her return to the big screen. Desperate for money, Joe accepts. By the next morning, his belongings have been moved from his apartment to a room over Norma’s garage, and she has settled all of his debts. Before long, Joe is relocated to a bedroom next to hers and becomes a kept man in her fantasy-filled life. The façade is largely orchestrated by Max, who is Norma’s former director and first husband. He projects her silent films in the living room for evening entertainment. He also writes fan letters under assumed names, so that Norma believes she has not been forgotten. After receiving a message that director Cecil B. DeMille called, Norma and Joe go to see him at Paramount Studios in her 1920s luxury Italian limousine driven by Max. Because of the director’s solicitous treatment, Norma believes she has made a deal with him to direct her comeback film. In fact, Max knows that the studio only wants to rent her Isotta-Fraschini (the limousine) for use in a movie. As Norma becomes more controlling and dependent on Joe, he finds respite away from the mansion, working on a script with Betty Schaefer (Nancy Olson). They fall in love. Norma finds out, and Joe tries to leave her. Her jealousy and his revelations of the truths behind her fantasy life lead to a violent ending. Director Billy Wilder, who also co-wrote the screenplay, liberally sprinkles fact with fiction in this story of Hollywood and fleeting fame. In real life, Erich von Stroheim, who plays Max, was a director of silent films who once worked for Swanson’s film production company. Former silent-film stars Buster Keaton, Anna Q. Nilsson, and H. B. Warner – whom Joe calls the Waxworks – come to the mansion to play bridge. Cecil B. DeMille, who plays himself, directed six of Swanson’s early films – roles that made her a star. Norma and Joe visit him on the set of Samson and Delilah, which DeMille was actually shooting at the time. If you think I’ve spoiled the movie for you by revealing too much of the plot, you needn’t worry – the opening scene reveals Joe’s fate, and the story is then told in flashback. Besides, with sumptuous sets by Hans Dreier and John Meehan, lavish costumes by Edith Head, and Franz Waxman’s Academy Award-winning score, in addition to the Academy Award-winning screenplay and Swanson’s brilliant performance, you won’t be disappointed. Hollywood’s top box-office magnet in the 1920s, Gloria Swanson had little in common with the character she portrayed in Sunset Boulevard. A fashion icon and savvy businesswoman, she was one of the first women in Hollywood who exerted control over her own career. Seeking more substantive roles, she turned down a studio contract in 1926 and started her own production company. She also was one of the few silent-film stars who successfully made the transition to talkies. 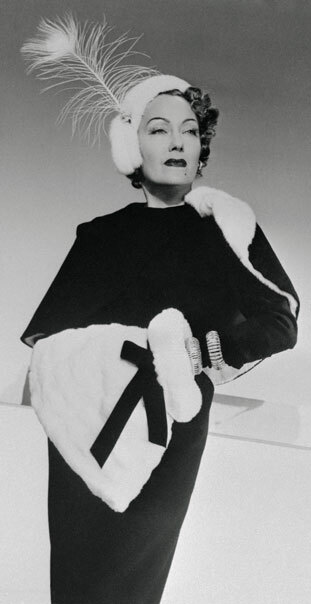 Following Sunset Boulevard, Swanson’s first major movie role in 16 years, she toured 33 cities to promote the film. Dozens of television appearances and starring roles in two Broadway plays followed. She also designed clothes under the label Forever Young and started a cosmetics line, among other businesses. Never one to look back, she was admired for her youthfulness and vitality. Her obituary in The New York Times (April 5, 1983) includes this Swanson quote: “No, I’m not much for the past. I’m concerned about tomorrow and what’s going on between dreams”.